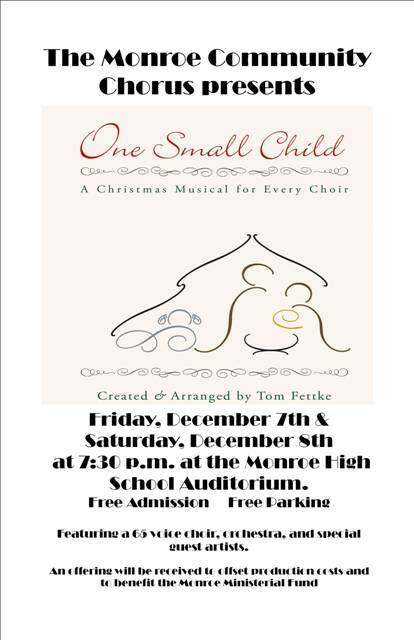 The Monroe Community Chorus, comprised of choir members from Monroe and Middletown area churches presents the Christmas musical, One Small Child, on Friday, 12/7 and Saturday, 12/8, at 7:30 p.m. at the Monroe High School auditorium. The concert features a 65 voice choir, live orchestra, and other special guest artists. The concert is free. An offering will be received to offset production costs and to benefit the Monroe Ministerial Fund. Thanks for placing this information on Main Street Monroe!